In this paper I will attempt to lay out the Biblical reasoning Bernward would have had for placing the stories as he did. I will first describe the doors then discuss the theological ideas as found in Biblical references and expressed in the art. Each door has eight panels and is divided into two registers by an inscription. 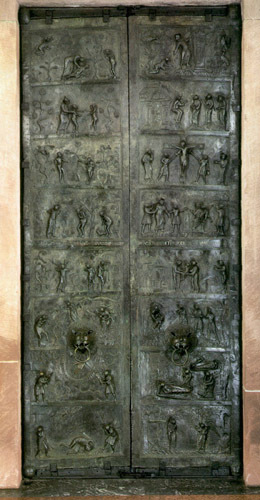 The left door's narrative runs from top to bottom and tells the Old Testament stories of Creation and the Fall of Man in the upper four panels and the Expulsion from the Garden to the Cursing of Cain in the lower four. The right door narrative runs from bottom to top. The lower four panels tell of the infancy of Christ from the Annunciation to the Presentation at the Temple, and the upper four tell parts of the Passion and after the Resurrection. The chronological narrative thus makes a U shape. The stories on the left door are taken from Genesis, Chapter 2:20 through Chapter 4:15. Panel #1 shows the Creation of either Adam out of dust or Eve from Adam's rib, I think the later option is more sensible due to the depiction in this art piece. In panel #2 God introduces Adam and Eve. God had instructed them not to eat fruit of the Tree of the Knowledge of Good and Evil. Eve was tempted by the snake to do so. In panel #3, we see Eve offering the fruit to Adam and his taking it. Panel #4 is God asking Adam and Eve what happened as they frantically pass the blame and His judging them. God decreed that they should no longer live in the Garden of Eden, that due to their disobedience they would eventually die, and that the ground would be cursed because of Adam and he could only get food from it by the sweat of his brow, and to Eve He said that He would "greatly multiply thy sorrow by thy conception; in sorrow thou shalt bring forth children; and thy desire shall be to thy husband, and he shall rule over thee." The snake was also cursed by having to crawl on its belly and eat dust. Panel #5 shows the Expulsion from the Garden; an angel drives them out. On this side of the door God is no longer directly depicted. Panel #6 illustrates Life under the Curse. Adam is working hard in the field, and Eve is nursing a baby who is thought to be Cain. Adam and Eve have two sons named Cain and Abel. Cain is a farmer, and Abel is a shepherd. They both bring sacrifices to God, but God favored only Abel's sacrifice. Panel #7 shows their sacrifices and the hand of God gesturing from Heaven in approval of Abel's sacrifice. Cain became jealous and when in a field murdered his brother, Abel. This is the first act of violence recorded in the Bible. God curses Cain for this murder. Panel #8 depicts the murder and cursing. The stories on the right door are taken from Luke 1:26-38, Luke 2:5-12, Matthew 2:1-11, Luke 2:22-35, Luke 22:54 through Luke 23:12, Luke 23:33-46, Luke 24:1-10, and John 20:11-18. Bottom to top the stories run like this: Panel #1 shows the Annunciation. The angel, Gabriel, appears to Mary telling her that she will miraculously conceive and give birth to Christ. In panel #2 is the Nativity, which is when Christ is born in a stable in Bethlehem. Chronologically panels #3 and #4 should be switched, because the story runs that forty days after the birth of Christ, He is taken to the temple and that is when Simeon and Anna prophesied over Him. About a year later is when the Magi arrived bringing their gifts. However, Bernward depicted the Adoration of the Magi in panel #3 and the Presentation at the Temple in panel #4. Here the narrative of the panels skips over most of the life and ministry of Christ and jumps directly to His trial. Here in panel #5, He is unrighteously condemned and sentenced to be executed. Panel #6 is Christ's death and the Crucifixion. Panel #7 shows the three women at the tomb after Christ has risen from the dead. An angel is informing them of this and instructs them to tell the others. Panel #8 records the first appearance of the risen Christ. He appears to Mary Magdalene in the garden. He tells her not to touch him, because He has not yet ascended to the Father. I believe that it is evident when taking the juxtaposition of the New Testament and Old Testament stories shown on the sixteen panels, that the theme of these doors is that of redemption. They show the need for redemption, how this need came about, what exactly the need is, and Who accomplished this redemption and how. Redemption in the religious sense is the removing of sin from man in order for man to be at peace with God. It is the ransoming of souls. Juxtapositioning these two stories Bernward shows the above in a vivid manner. As a bishop, Bernward would have been very familiar with the Bible, and according to the text book he was quite a scholar. It is therefore safe to assume that he would have been aware of the Biblical texts I will be quoting, and I believe it will be made evident that his reasoning in arranging the panels is based on these texts. Comparing Adam and Christ is Biblically based from Romans 5. Much of what is artistically depicted and theologically reasoned out comes from this section of Scripture. Christ is shown as the second Adam, His life and work replacing that of Adam. Romans 5:12-21 says, "Therefore, just as through one man sin entered the world, and death through sin, and thus death spread to all men, because all sinned -- (For until the law sin was in the world, but sin is not imputed when there is no law. Nevertheless death reigned from Adam to Moses, even over those who had not sinned according to the likeness of the transgression of Adam, who is a type of Him who was to come. But the free gift is not like the offense. For if by the one man's offense many died, much more the grace of God and the gift by the grace of the one Man, Jesus Christ, abounded to many. And the gift is not like that which came through the one who sinned. For the judgment which came from one offense resulted in condemnation, but the free gift which came from many offenses resulted in justification. For if by the one man's offense death reigned through the one, much more those who receive abundance of grace and of the gift of righteousness will reign in life through the One, Jesus Christ.) Therefore, as through one man's offense judgment came to all men, resulting in condemnation, even so through one Man's righteous act, the free gift came to all men, resulting in justification of life. For as by one man's disobedience many were made sinners, so also by one Man's obedience many will be made righteous. Moreover the law entered that the offense might abound. But where sin abounded, grace abounded much more, so that as sin reigned in death, even so grace might reign through righteousness to eternal life through Jesus Christ our Lord." The particular acts referred to here are the taking of the fruit and the crucifixion and the Resurrection of Christ. On an expanded scale it is the contrasting lives of Adam and Christ. I want to begin my theological and artistic comparison of the parallel panels at the tops of the doors and work down to the bottoms for the sake of clarity and attempt to avoid confusion. 1) The Creation of Adam or Eve -- Christ's appearance to Mary Magdalene. Both involve new creations of bodies. On Adam and Eve's side we are shown the active creation with God physically forming the new body. I believe it is the creation of Eve in which Adam was put into a deep sleep, and God formed Eve from one of Adam's ribs. Christ is shown appearing for the first time in His new glorified Body. Both scenes are in gardens, and both scenes have God directly involved. I believe the implication of the paralleling of these scenes is to remind us that we, as Christians, are a new creation in Christ, not in corruptible flesh. Artistically, the panels don't have direct parallel such as characters being in the same position in both panels. However, thematically and by the Scriptural knowledge of those times, I believe people would have understood this to be the case. 2) The meeting of Adam and Eve -- the angel announcing the Resurrection. Both are moments of great joy. The one is a completion of Paradise, the other a restoration to Paradise through the Resurrection of Christ. Both involve waking from sleep or death in order to facilitate a new creation. Adam had to sleep to have his side opened for the making of Eve. Christ had to sleep in death to redeem the Church. I think it is interesting to note that at the Crucifixion, Christ side is pierced, though I don't believe this is necessarily a correlation to Adam. They also are both injunctions to be fruitful and multiply. The one is do so physically, the other spiritually as the three women are instructed to spread the news of Christ's Resurrection, which is the Gospel or Good News in part. Artistically, there is once again very little paralleling other than the fact that God, or a messenger of God, presenting the good gift or the news of the good gift are both to the left of the panel and both scenes are once again in a garden. 3) The Fall of Man -- the Crucifixion. These two panels are the real focal point theologically of the doors. The moment of the first sin that begins the entire curse and separation from God and thus necessitates redemption which can only be made by a perfect Sacrifice. And only God is perfect, thus Christ must become a man in order to die, though remain God in order to be perfect, so that His perfect sinless life can cover the sinful life of Adam and all mankind. He must rise again to conquer death which is the consequence of sin. This substitution of life for life and perfection for sin is shown very strongly in the art. In the panel of the Fall, there are three trees with Adam and Eve eating from the middle tree. In the opposing Crucifixion panel, Christ is in the center on the cross flanked by the man with the spear which pierces his side, whose gesture is very similar to that of Adam, and by the man with the sponge on a stick whose gesture is similar to that of Eve's. Interestingly, the two crosses which would have flanked Christ with the two thieves are not shown in this panel, although it is safe to say everyone at that time would have known there were three crosses (or "trees"). Instead of those two other crosses, John the Evangelist and Mary are there. 4) Judgment -- Judgment. The correlation is evident. God righteously judges the sinners, and Christ's judges unrighteously judge the perfect, sinless One. It shows that Christ is taking our judgment upon Him, because He is the only One who can pay. Artistically, the flow of the panels are reversed. In the one, God judges Adam and Eve with His accusing finger going at a left to right arch. In the other, man judges God in a right to left arch. In both panels God is on the left side. 5) Expulsion -- Presentation at the Temple. In the one, Adam and Eve as the representatives of all mankind are cast out in great sorrow from God's kingdom, the Garden of Eden. In the other, Christ, as the representative of mankind, is accepted with great rejoicing into God's kingdom, the Temple. 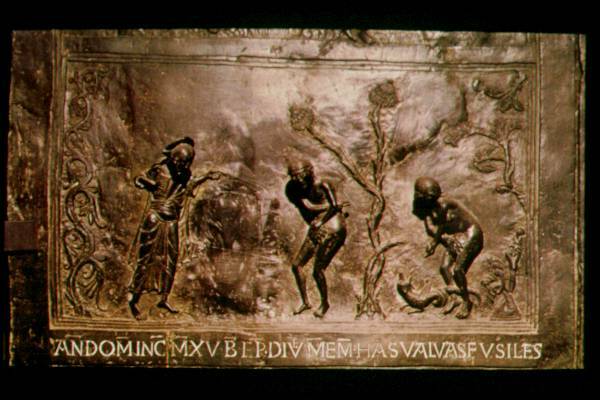 In the Old Testament panel, Adam and Eve are shown entering a city on the right side of the panel. This is very strange, since there would not have been cities at that time. However, I believe it may be to indicate entering the world of man, the world of sin. In the other panel, the Temple, on the left side of the panel, right next to Adam and Eve's city, but is a place holy to God. It is in a way a reversed direction of travel. One goes from the Garden of God out into the city of mankind, left to right. The other is entering from the world into the place of God, right to left. That is the artistic correlation. 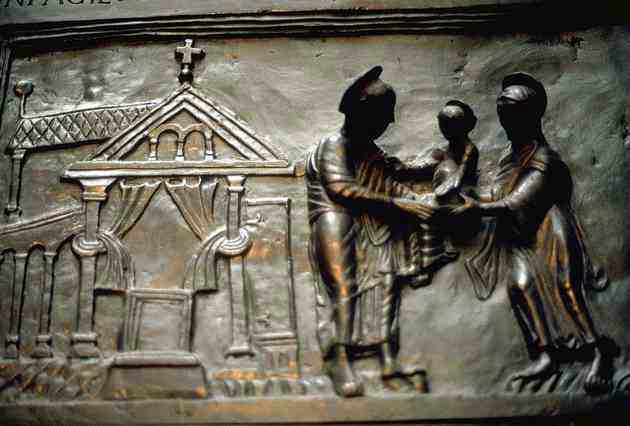 6) Life under the Curse -- Adoration of the Magi. The parallels are that both panels on their inner edges have nursing mothers (right next to each other) on elevated seats under some kind of architecture. Eve is nursing Cain who will be the first to fulfill the ultimate effects of the curse by murdering his brother. Mary is nursing Christ who will be the fulfillment of the prophesy of Redemption. Genesis 3:15 say, "I will put enmity between you (the snake) and the woman, and between your seed and her Seed; He shall bruise your head, and you shall bruise His heel." This is the first prophesy of the coming of Christ to conquer death and Satan. It occurred at the judgment of Adam and Eve, but is implied here by showing Eve raising up the first of her seed, which would be unto sin, and Mary raising up the prophesied Seed, the Firstborn of God unto righteousness. Adam's laboring in the field to gain food is a contrast to the Magi's bringing gifts. 7) The Sacrifices of Cain and Abel -- The Nativity. Abel's sacrifice of a lamb is good and acceptable to God. The coming into the world in a stable of God's Sacrifice, the Lamb of God, is an interesting parallel. The one is the first acceptable sacrifice recorded, and the other is the last and perfect Sacrifice. In the art there is no parallel here except that both of the good sacrifices are on the left sides of the panels. 8) The Murder of Abel and Cursing of Cain -- The Annunciation. These show the complete example of life under the curse, which is murder and complete separation from God paralleled by the announcement of the beginning of the end of the curse. 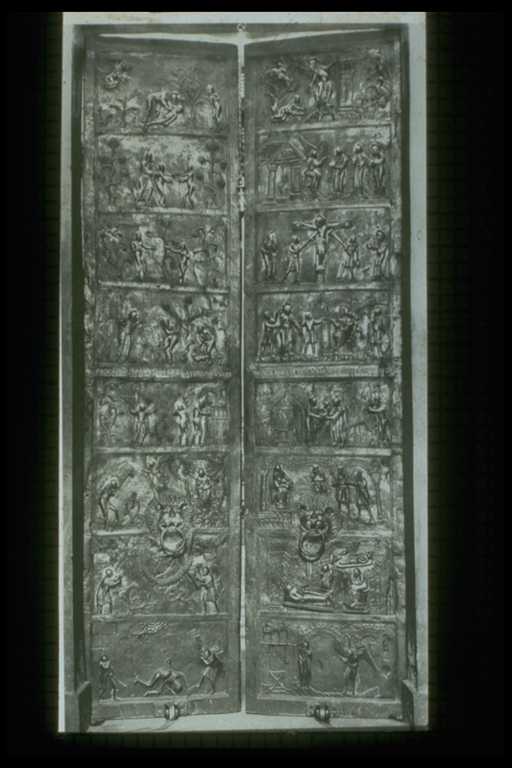 In the Old Testament panel the direction of the narrative has been changed from left to right to right to left. I believe this is to show the large gap in time between the juxtaposed scenes and that this mayhem and separation from God continues until the coming of Christ. Some further parallels are diagonal. The last frame on each of the doors' narratives (the bottom of the left and the top of the right) deal with the end results of the lives. The one shows a result of the way Adam lived, the other the result of the way Christ lived. One is death and separation from God and the looking forward to the coming of Christ to remove suffering, which is the result of sin. The other is new life and union with God and the looking forward to the Second Coming of Christ (He must first ascend but will return), which is to live in Paradise, the result of the redemptive Act of Christ. I believe that Bishop Bernward as a scholar and a church man would have been aware of these theological parallels, and as an artist he purposely chose these scenes and placed them next to each other in order to communicate the above ideas. I hope I have proved that that is at least possible, and I believe it is the case. I also believe them to be beautiful in and of themselves and not just for their theological value. The skill and creativity it took to make them is truly impressive, and they are now one of my favorite art works.